A green salad is my favourite go-to when I want to add more veg to a meal. Especially now Fergal is older and we’re trying to have more family dinners, it can be ‘too much’ effort to mix up a salad dressing and toss in some leaves. But over the last few months I’ve discovered a trick that makes salad making 1000% easier (and more likely to happen!). 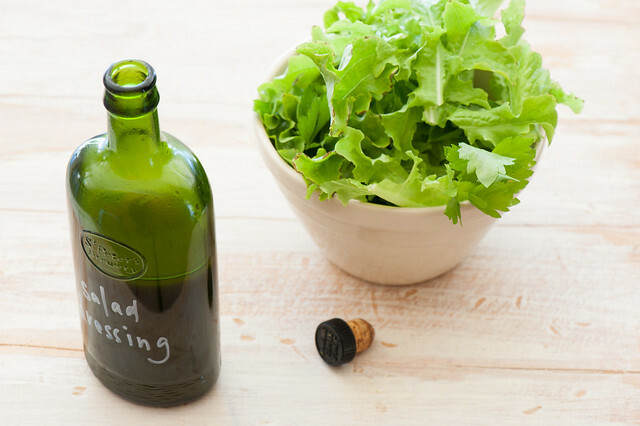 Just make your dressing in bulk and keep it in a bottle on the dining table. That way all you need to do at dinner time is get some leaves in a bowl. And then dress once you’ve sat down and the rush is over. 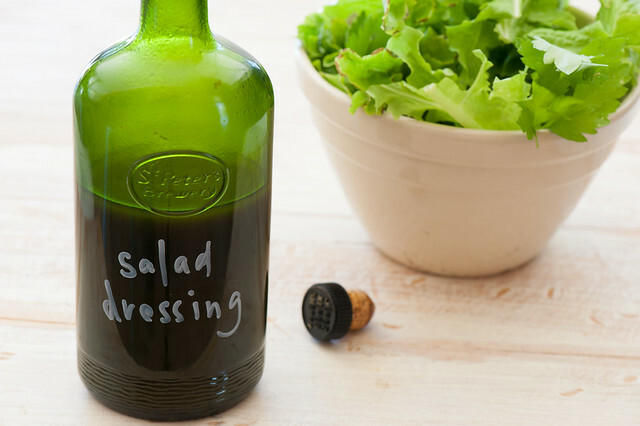 This has been my go-to salad dressing for years. The addition of soy sauce gives saltiness but also a really lovely and unexpected depth of flavour. I tend not to add herbs or garlic so it can be kept on the dining room table (for months) instead of the fridge. But see the variations for other possibilities. 1. Measure out and combine ingredients. Pour into a jar or bottle. 2. Seal and shake well. Taste and add more soy or some salt as needed. soy-free – replace soy sauce with coconut aminos or skip it and season with sea salt instead. different oil – EVOO is my favourite but you’re welcome to use other well flavoured oils if you like. sweeter – use balsamic vinegar or a caramelized red wine vinegar or a tablespoon honey. herby – a few leaves or tarragon are lovely. As are a handful of chopped parsely or basil. If using herbs keep in the fridge and use asap, preferable no longer than 2 weeks. mustardy – add 1-2 tablespoons dijon or wholegrain mustard. OK to keep this at room temp. garlicky – I’m not the hugest fan of garlicky dressings but feel free to add a small crushed clove of garlic. Keep in the fridge and use within 2 weeks if using garlic. single serve – to dress enough salad for 2 people I usually use 2-3 tablespoons EVOO, 1 tablespoon vinegar and 1 teaspoon soy sauce. – leaves taste peppery ! I usually keep a small jar of homemade vinaigrette in the refrigerator. I will definitely try this one to leave on the counter! My trick for eating more vegetables was signing up for a community supported agriculture (CSA) share. Sadly I’ll be picking up my last share for the season tomorrow. Thanks so much for offering this sale. I just took you up on it! Thanks! I have used vinegar/oil mixes as dressings before, but I do like the idea of adding a little soy sauce (with bonus not needing to refrigerate). I love vegetation food as it’s healthy as well as not harm environment and vegetable salad is very helpful for good apatite. You have showed some very good tips like replacing soy sauce with coconut aminos which looks me great as i don’t like soy sauce much. I was a vegan for four years. I only ate raw foods. But recently starting in 2006 I started eating fish again, and chicken. Nowadays when I find myself eating out too much, I head right to the refrigerator and start balancing my diet with a healthy salad. I usually use Iceberg Lettuce, Cherry Tomatoes, and cucummbers. Standard .But I found that people who are just returning to eating salad again. Yes, cucumbers are really affordable. They’re $.49 each per huge cucummber. What a deal. Same for Bannana. You can literally get 4 Bananas at Giant for $1.00. The next time somebody wants to eat healthy, they might find its not only good for them, but affordable. Nice article. You inspired me to write a short post on my favourite dressing…although a vinaigrette is nothing new. I hope that’s ok!